Want to take on the hardest Tour de France climbs? Paul Henderson, author of Cycling in the French Alps, has done the maths and says Savoie and Haute Savoie in the Rhône-Alpes are the places to be. Why do most 'cycloclimbers' feel the need to categorise and compare the mountains they have toiled to conquer? Perhaps because cycling up big hills is a slightly masochistic pastime in which a great deal of the pleasure comes from achieving a difficult goal after a long, hard struggle. 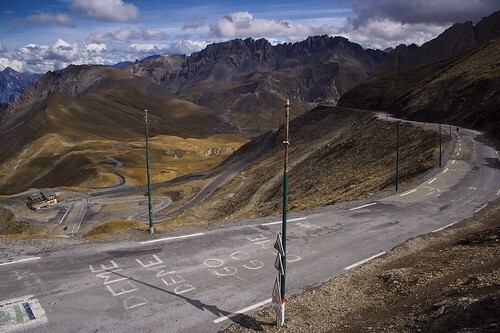 But is the Galibier harder than the Tourmalet? Is Mont Ventoux more of a challenge than Alpe d’Huez? In these examples, the differences between the climbs are large enough that the answers (yes in both cases) leave little room for debate. But what about more similar climbs, such as the Col de la Madeleine and the Col de la Croix de Fer? To settle such debates, cyclists have developed a number of grading systems based on a climb’s length and average gradient. Of all these methods, the 'gradient-squared system' stands out as giving a good idea of how hard a climb will feel, while still being easy to apply. The gradient-squared system is based on the premise that the relationship between the gradient of a slope and the effort needed to cycle up it is far from linear. For example, an ascent of 600m over 10km will feel easier if the gradient is a steady 6% all the way (slope A) than if it is 3% for 5km, and then 9% for 5km (slope B). To take this into account, the gradient-squared system sums the squares of the gradients for each individual kilometre. Thus, for the two examples cited above, slope A would score 360 points (62 x 10 = 360) and slope B would score 520 points (32 x 5 + 92 x 5 = 450). Carrying this over to the four passes mentioned in the introduction confirms that the Galibier (1680 points – starting from St Michel de Maurienne) is harder than the Tourmalet (1090 points – starting from Luz St Sauveur) and that Alpe d’Huez (905 points) is easier than Mont Ventoux (1340 points – starting in Bedouin). But what about the Madeleine and the Croix de Fer? 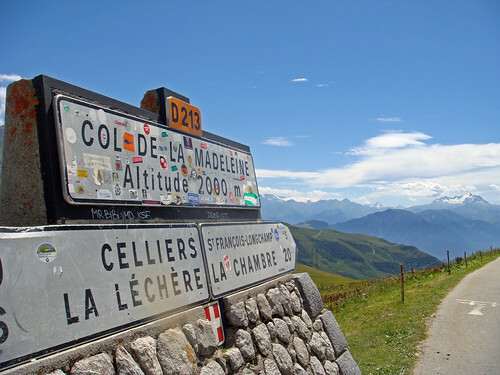 It depends where you start – the Madeleine from La Chambre is the hardest climb, followed by the Croix de Fer from St Jean de Maurienne, then the Madeleine from Aigueblanche and the Croix de Fer from Bourg d’Oisans. Applying the gradient-squared system to all the major climbs in the départements of Savoie and Haute Savoie, it was found that 116 ascents score more than 750 points – equivalent to a 1st category or “hors catégorie” climb on the Tour de France. In addition, Savoie is home to more hard climbs than any other département in France. This realisation led the Savoie Mont Blanc tourist board to draw up a map of difficult ascents to create a circuit for 'col-baggers', and to fit the most classic climbs with kilometre posts showing the distance remaining and the average gradient for the coming kilometre. Further information about these itineraries, including ideas for base camps from which to do several of the biggest climbs, can be found on the tourist board's website (most of this information is only available in French at the moment; however, there are plans for a more comprehensive English version of the site in the spring, and anyone needing more information in English is asked to call the tourist office). For fanatical cyclists, one of the best places to be based is St Jean de Maurienne, a small town (actually a city, as it has a cathedral) that lies at or near the foot of some of France’s greatest passes, including the Galibier, Iseran, Croix de Fer, Glandon and Madeleine. Anyone thinking of spending a week cycling in the Savoie Alps would do well to look at the Pays de Maurienne website – marketed as covering "the world's largest cycling area". The site is a goldmine of information about the Maurienne Valley, even though the English version of the site is not (yet) as comprehensive as the French version. In addition, the tourist office in St Jean is one of several in the area where you can rent 'Timtoo' (only in French, German or Italian, unfortunately) timing chips, which allow you to time your ascents of the major passes. All the famous passes accessible from St Jean, plus the Cormet de Roseland and Alpe d’Huez can also be integrated into a fabulous multi-day circuit that will be described in a subsequent article. Cyclists looking to combine a few challenging rides with some more leisurely sightseeing might consider Chambéry as a base. Chambéry’s attractive old town is a mere 12km from Lake Bourget, France’s largest natural lake (bike path all the way), and within easy reach (by bike or by train) of more traditional tourist honeypots, such as Annecy. In addition, the city is surrounded by quiet roads that offer great cycling over the passes of the Chartreuse and Bauges mountains. And a visit to Chambéry would give the hardened cycloclimber a chance to pit themselves against the redoubtable Mont du Chat – 1250m of ascent in 13.5km, and a gradient-squared score of over 1200 points. See our Where to Stay section for bike-friendly accommodation options, or zoom into our map below. 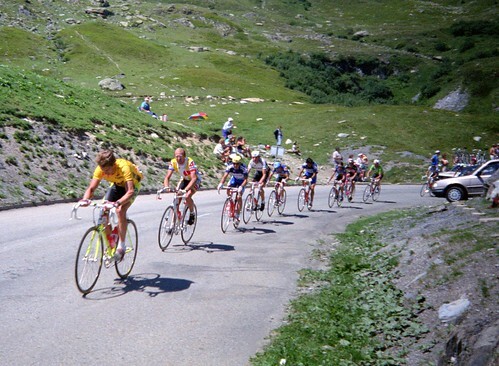 There are a number of books that compare all the major Tour de France climbs. They include Tour Climbs: The Complete Guide to Every Tour de France Mountain by Chris Sidwells, Mountain Kings (UK, US) by Giles Belbin, Ascent: The Mountains of the Tour De France by Richard Yates, and Ride a Stage of the Tour de France: The Legendary Climbs and How to Ride Them (UK, US)by Kristian Bauer. There's also Mountain High: Europe's 50 Greatest Cycle Climbs by Daniel Friebe. To see the Tour de France up onthe mountains, you can't go past Graham Watson's Tour de France Travel Guide (UK, US). See also Stephen Lord's Freewheeling France guide to making climbing mountains that little bit easier. Paul Henderson is the author of Cycling in the French Alps, published by Cicerone.